This item currently has a special mail-in rebate of $25.00 that is good through 4/30/2019! Click here to download the rebate form. This item currently has a special mail-in rebate of $25.00 that is good through Tuesday, April 30, 2019! Click here to download the rebate form. The Yaesu FTA-450L is a VHF Airband Transceiver packed with features, yet very affordable. Boasting an oversized full dot matrix LCD display, the FTA-450L Airband Transceiver provides full communication on the Aircraft communications Band ("COM" band: 118 ~ 136.975 MHz). The Yaesu FTA-450L includes NOAA weather band monitoring and the capability of programming up to 200 memory channels with a quick and easy channel recall feature. The brand new, easy to operate, menu system is icon driven making it simple to navigate through all of the powerful features this transceiver has to offer. Additionally the Yaesu FTA-450L can easily be reprogrammed in minutes using the optional PC Programming software and the supplied USB programming cable. Easy to operate! The FTA-450L comes configured with an easy to operate icon driven menu system. The displays and menu settings are logically configured for a more intuitive user interface. Great display! The FTA-450L features a huge 1.7" x 1.7" full dot matrix LCD display with full backlight and dimmer. The high resolution display makes it easier to view all the great features the FTA-450L has to offer. 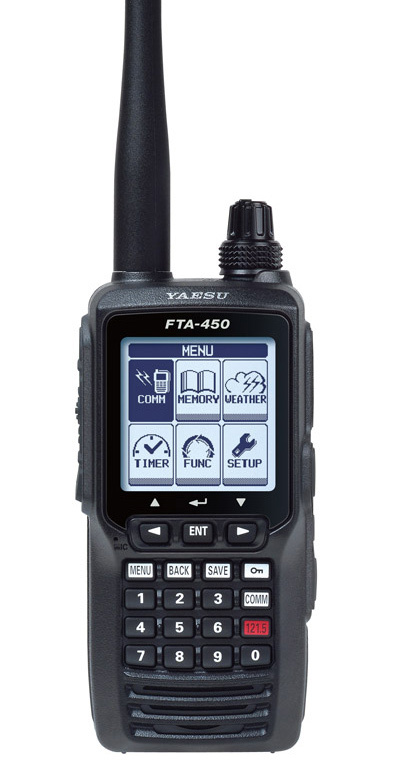 The Yaesu FTA-450L features a IPX5 waterproof design protects it against rain and water jets. Great for flight line personnel, airshow use, and anyone using a transceiver outdoors where it may rain. In addition it's 800 mw audio amplifier makes the FTA-450L louder than any other handheld transceiver available today (for example, it's about 35% louder than the Icom IC-A23). The Yaesu FTA-450L is powered by a high capacity 1800 Mah Lithium Ion battery that will last over 13.5 hours between charges. 200 memory channels can be easily programmed into the FTA-450L allowing quick easy access to frequently used channels on the aviation band. Each "book memory" channel can be programmed into the unit using the optional PC programming software and cable. All memory channels can be labeled with either a channel number assignment, operating frequency display, or an alpha-numeric channel name display. Breaking the squelch threshold has never been easier. Press the Squelch button for two seconds and the FTA-450L's squelch remains opened for monitoring weak and distant signals. Pressing Squelch again restores squelch settings. This is TRUE one handed operation. No need to fumble with tightly spaced concentric knobs! Receiver Battery Saver feature is designed to maximize the life of the transceiver's battery. When the FTA-450L is in the standby mode the battery saver de-energizes the transceivers circuitry, waking up at user selected intervals to sample for radio activity. If no activity is detected the FTA-450L goes back into its sleep mode. Current consumption is minimized, thereby maximizing battery life. This feature is only found on Yaesu's air band transceivers! The FTA-450L can receive all 10 NOAA weather broadcast frequencies. The Automatic Active Weather Channel Locator automatically scans for active NOAA weather stations in your area when the Weather band is selected. TX 118.000 - 136.975 MHz (COM Band), RX 118.000 - 136.975 MHz (COM Band), WX channels WX-01 - WX-10 8.33 Khz channel spacing. Review: This is my second Yaesu handheld and the overall quality and reliability is excellent. The only reason that I do not rate the FTA-450L with 5 stars is that the button placement is very poor with the on/off button right above the transmit button. Q: I have just purchases the FTA-450l Radio.It has a 110v ac charger, We operate on 230 volts Do you have a 230 v charger? A: Yes, there is a 220v charger available too. Q: Is the 'charger cradle' a desktop charger? A: Yes, this is a desktop charger. The Yaesu SBH-11 Charging Cradle as shown here is the one included with this transceiver.